Versatile Circulating Nurse ensuring the safety of patients by serving as integral member of the surgical team. Adept at collaborating with key OR personnel and rendering attentive preoperative and postoperative nursing care. Specialize in establishing compassionate relationships with patients through astute observation. ¥ Continuously monitored the condition of patients and noted any changes. ¥ Confirmed that patient information was correctly entered into database. ¥ Reviewed lab tests and reported any abnormal results to physicians. ¥ Assessed and reassessed patient conditions as per care instructions. ¥ Implemented and evaluated patient care plans. ¥ Assessed the overall condition of patients and assisted with discharge plans. ¥ Educated patients and family members on procedures and what to expect. ¥ Coordinated with core team members to ensure consistent patient care. ¥ Supervised supporting nursing staff and delegated responsibilities. There are plenty of opportunities to land a Circulating Nurse job position, but it won’t just be handed to you. 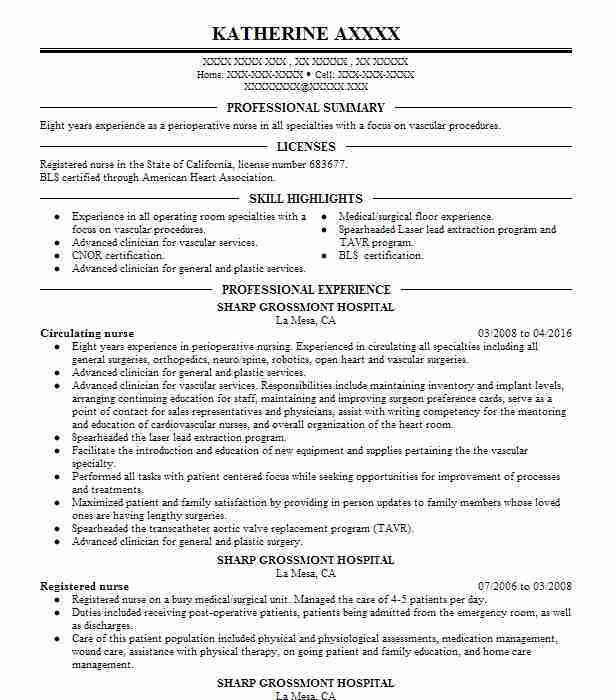 Crafting a Circulating Nurse resume that catches the attention of hiring managers is paramount to getting the job, and LiveCareer is here to help you stand out from the competition. 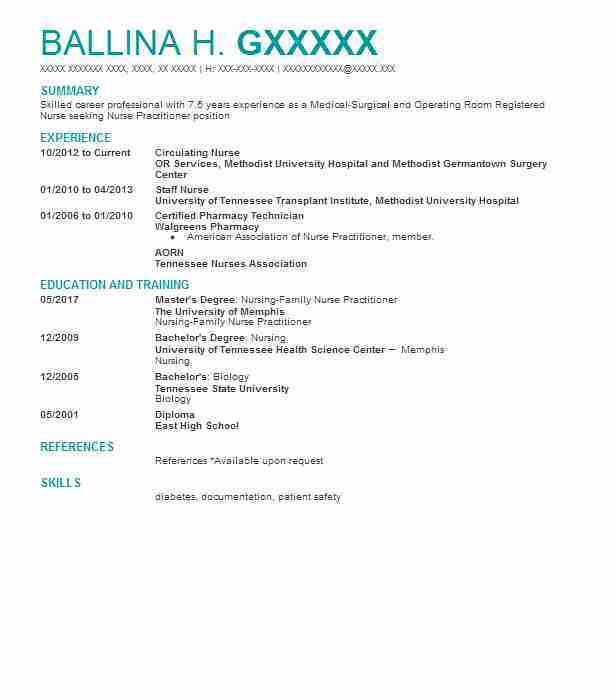 Summary: Nine years experience as a perioperative nurse in all specialties. 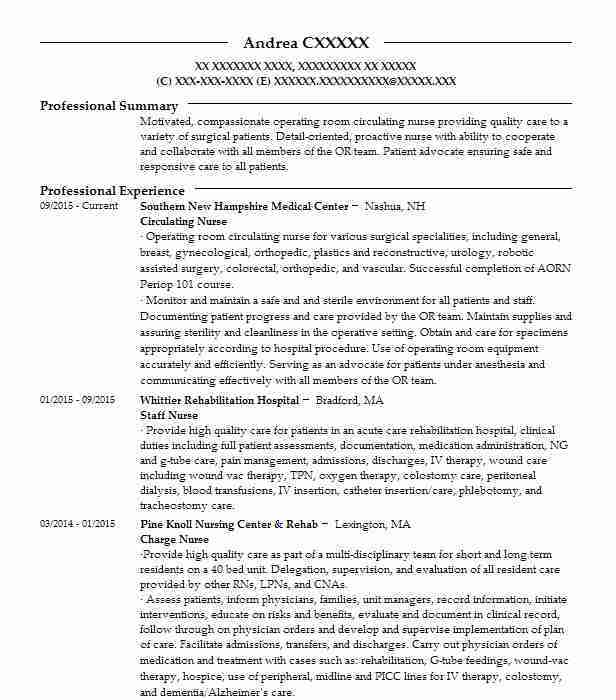 Summary: I 10 years nursing experience in cardiac telemetry, PACU, and Operating room with strong clinical and people skills.